When we look back on the Farrelly brothers, do you think we’re going to refer to these last few years as the late years or the middle years? This is the key question in play, because if they turn out to be the middle years, that will mean either a) they experienced some sort of career rejuvenation and made another comedy as good as Dumb & Dumber, Kingpin, and There’s Something About Mary, or b) they somehow managed to drop from mildly entertaining to below-average. I think they’ve got another few classics in them, but under no circumstances would I take that prediction to Vegas. 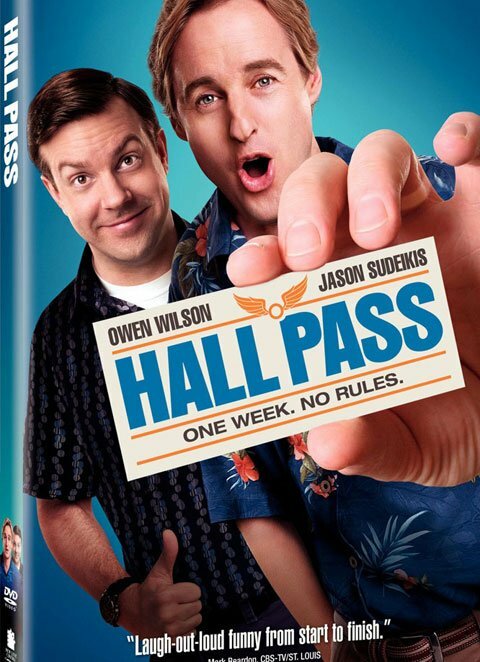 Regardless of what the period ends up being called, we’re amidst the blandly enjoyable portion of their career, which means buying Hall Pass on DVD would be an acceptable use of your money but not one I’d openly advocate for everyone. The Owen Wilson/Jason Sudeikis comedy follows the two bumbling everymen as they freak out after receiving a surprise hall pass to cheat on their wives for one week. Contrary to what Natalie Portman might mistakenly tell you, there are strings attached, and the plan runs afoul almost immediately. That’s faster than this Blu-ray/DVD combo pack will hit stores, but something tells me most people won’t wait on pins and needles. The June 14th release will feature an extended version, deleted scenes, and a gag reel. Personally, I hate at least 90 percent of all gag reels on account of their singular awfulness and too inside-the-production nature, but I still secretly root for more of them on account of the other 10 percent that feature improved lines and wacky shenanigans beyond laughing during a take. You can take a look at the cover art below.